As I have learned over time, discernment is not simply a list of steps. Sure, one can frequent the steps of accurate journalism or the proper procedure for fair legal investigation, but discernment is another process entirely. This is a process of self-exploration and introspection. Instead of examining this or that source for the truth of the matter, a person must find their way to the truth within themselves. It has only been recently that I have been able to remove all of the blockages which hindered me from putting this process of discernment into words. So hopefully, I can finally begin to do what I originally intended to, and I hope that you can benefit from the results in numerous ways. This article is an exploration of the discernment process, or more specifically, the concept of mental flexibility. Within this talk, I intend to show why there is a strong need for us to keep our perspective flexible and open to newness at each step of our journey. When we first awaken, there are a number of experiences we can have, as well as numerous personal responses to these experiences. Among these is the excitement about what our new perspective has shown us. Our eyes are open for the first time and we are eager to experience everything we can with our new perspective. At this stage, it's typical that we are unaware of exactly what has changed, but we know within ourselves that somehow—the world seems different. Mental Health Daily - What Is Cognitive Flexibility? As we continue, we may realize that the activities we used to enjoy aren't so enjoyable anymore. We may write off this sentiment, think to ourselves that we are just having an off day and dismiss our dissatisfaction, but we realize that the dissatisfaction isn't going away. Eventually we realize that this change of sentiment represents a need for the search for new experiences. Along with this realization, we become aware of something else. It seems that now, the information which used to be completely acceptable to us no longer makes any sense. We realize that most of the conversations, the movies and televisions shows we used to enjoy are only cookie-cutter repetitions of the exact same situations—rehashed so as to appear new. Some may realize that many of these repetitive themes are not very healthy for to be exposed to on a daily basis. More and more we have the a strange feeling that somehow these repeated themes were designed to be distractions and distortions from the new questions we find ourselves asking. It seems that when we awaken, we become aware that the supposedly factual information that we have been given throughout life was heavily distorted as well. We may realize that even though we were given good grades in school for placing answers on a piece of paper at test time, we didn't really learn much, and what we did learn didn't give us the ability to use our own inner power. We can realize that we have grown up with the same story about life, and that while we were busy answering someone else's questions, we never answered our own. There could be as many variations of awakening experiences as there are people to experience them. During this process, there are certain steps that a person must take in order to navigate the mine-field of half-truths and the mostly-truths, along with the blatant disinformation that has been laid out for us by those who originally put us to sleep. Quora - What does being grounded mean and what are the best ways for someone to be grounded? There are countless sources from which a person can choose nowadays, and every one of these sources seems to be different in some way. Having our new awareness of our responsibility of determining our own truth, we must learn to determine which sources feed us most healthily and best help us along our journey of self-exploration and realization. Along this path, it is important that we maintain our own sense and respect for self. We are stronger than we may think. This self-acknowledgment and respect relates primarily with our right to exist. It is a common belief that we as sentient beings have essential rights to health, to vital resources, and to opportunities to prosper freely. (As I have pointed out before, these rights stand with the pretext that we do not infringe upon the rights of others.) Along with these rights is the right to think and act independently from the interference of others, and it is within this right that our responsibility lies. Jiyushinkai - What Does It Mean To Be Centered? As we question, and as we come across various answers, it is important that we do not stagnate or fixate on an ideology simply for the sake of emotional security. Before we awoke, we were a passive member of society, and in that state, we had little or no inclination to question any societal norm. At that time, we allowed these societal norms to make our decisions for us, and to determine our course in life. This is typical within the average person's life, as society offers a sense comforts and acceptance to us when we conform to the rest of our peers. However, when we awaken to the freedom which true life has to offer, we are compelled to think and to question more of these societal norms. In our quest to learn what it is to be awake, it is important that we avoid the various pitfalls that can await us along our path. One of these pitfalls includes the temptation to cling to an ideology simply for a sense of emotional security, belonging, or normalcy in one's life. It is a given that we start our journey in a state of ignorance, and any learning that we experience only happens in the moment. In other words, this journey has no instruction manual. This state of ignorance can be very frightening for some. This fear of ignorance is technically called agnosiophobia or the fear of not knowing. This fear of ignorance could easily explain the common tendency for people to feign knowledge about a subject even when they may know very little about that subject at all. It is common for people in leadership roles to pretend to have all of the answers because they want to be respected. They may also become obsessed with the attention that this illusion of knowledge typically brings them. Consequently, when presented with questions about unfamiliar subjects, many would rather risk misleading others than look incapable in front of an audience. On our search for answers, this fear of our own ignorance can have serious consequences as well. This fear can actually lead us to the ideological fixation mentioned before, in that instead of keeping our ideology flexible and open to new input, we become stuck upon one idea because that idea gives us emotional security. In this state, we may be subconsciously intimidated by the demands of our own new-found independence, and instead of enduring our much-needed journey, we simply cave and turn back to our life of conformity. Though this conformity may be different than that of typical society, it still distracts us from our inner search for truth. In this situation, we may find a group that has fixated on the same ideology as our own, and we become comfortable in our stagnation. So how can we tell if this has happened to us, and what can we do to change it? If we ever find ourselves among a group of people that has ceased their own search for truth and self discovery, and have instead turned their focus to a detached theme that offers no real change or progress, we may have settled for comfort over truth. This can typically be found in a group that is based upon one theme, and endlessly discusses that theme without actually making progress toward a productive end. Though these groups may claim the desire for progress, there are typically little or no actual steps toward it. These groups can be fairly attractive. To some, they can even be more attractive than the journey of self discovery. It is typical in such groups that we find many people with whom we can relate. We may even have a sense of belonging in these groups. However, little do we realize that within these communities, we have left our own inner identity behind. Instead of giving ourselves the credit and self-examination we deserve, we make the center of our lives an idea that we had no interest in before we discovered it and gave our power to it. We agree to let go of what we know, but make no effort to thoroughly evaluate what we are being given in it's place. This is typically the situation we will find in a cult. The truth about cults is that they do not always take place in strange buildings with cryptic symbols on the front. These groups can actually form out of any group that already exists. This cult behavior can spawn from any ideology which offers an explanation on life's mysteries. These groups do not need a name initially. Their initiation only requires the agreement of any number of members to give their power and emotional security over to an idea. When the idea has more power and value than the individual, that is when the cult has formed. If this is the definition of the word cult, it may be that society has more cults within it than we have acknowledged. Many cult-like groups will advocate the concept of unlearning what you have learned, but then replace our past lessons it with equally flawed beliefs. In this act, these groups subtly demand that member forget all of their previous knowledge for the sake of the new ideology. This would mean that political parties were a form of cult since they consist of groups that supposedly hold their own ideologies. Those within the various parties define themselves by the standards of that party instead of letting their own thought define them. The above definition of the word would also mean that sports hold a large number of cults within them. Rooting for this team or that team might not be extremely unhealthy for some, but the overall act of fixating on an official sports team simply for the sake of the team can be a sign of cult belief. When we congregate with others who share the same belief, this cult-status becomes even more apparent. Certain television shows and movies offer the possibility of cult gatherings and ideologies. When people give their minds over to this or that theme, it can become a source of emotional security. The theme itself can have just as much of an impact on a group's emotional state than events in their actual lives. This is not to say that all television is unhealthy simply because it is attractive. The acceptance of any theme and its impact are completely dependent upon the individual. What is important is that a person does not neglect their own right to intimately know themselves, and to value and honor themselves above any theme or ideology. As long as we do not replace the importance of our own being with a supposedly important idea, any interest can remain just that—an interest, and not a source of life purpose. The prospect of finding truth in this world and in this universe is quite a task to undergo. However, this task does not have to be difficult. The goal is not to be right, as many may believe. The goal is to be clear enough (in focus and in energy) that when the correct answers come to us, we will know. The fact that all of the answers are not spelled out for us may be intimidating for some. However, for others, this mystery offers an exciting adventure to embark upon. 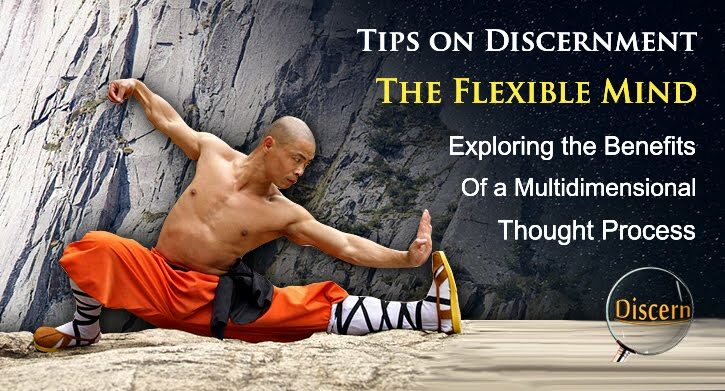 When we see contortionists we may be impressed by their skill and flexibility, but along with our impression, we may also cringe at the thought of attempting to do the same thing ourselves. However, with practice and dedication, we also have the ability to stretch beyond our limits. This applies to mental flexibility as well. As we search for the next answer, it is important that we respect ourselves in the process. It is also important that we do not short-change ourselves and declare the mystery solved and the journey over simply because we have become comfortable. If we ever come across an idea of what seems to be true, it is important that we remember a number of things. This is that we have not yet reached a point where we can see truth clearly. Even if we see what appears to be true, this does not mean that it is. Oftentimes, when we believe we have found truth, there is much more to the story. Until we have eyes to see beyond our present obstacles, all we have are perspectives of what appears to be true. Even if there is apparent absoluteness in any idea, we do not have the perception to determine any supposed absolution that might exist. This is what it is to be veiled. Until we are able to see the universe as it actually is from a vantage point above our present dimension, we do not have absolute understanding of anything. This does not mean that truth does not exist. Nor does it mean that there are no answers that we can rely upon. There very much are. However, it is not my place to tell anyone exactly what these answers are. It is only my intent to introduce each individual to the importance of the self, and to bring awareness to our right to independent thought. 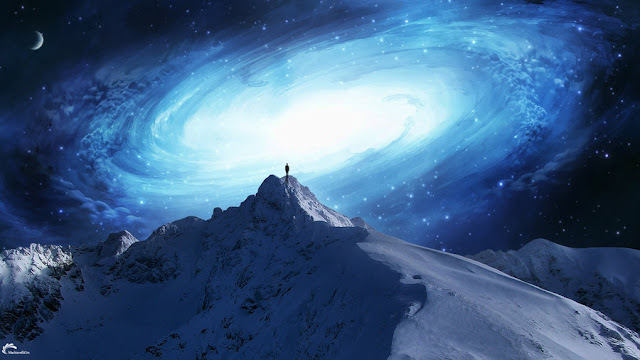 The only way we will be able to know truth is if we are able to rise above our present dimensional juncture and to free ourselves from dependency upon any ideology for emotional security or stability. As stated before, this stability must come from within. The bottom line is that no matter how high in perspective we are (or think we are), there is always a dimension higher than our present one. No matter how much we believe ourselves to know, there is always another piece to the puzzle. There are those who reject new ideas for various reasons. This rejection can be caused by a fear of the need to admit ignorance. As we may know, it is necessary to let go of the illusion of knowledge before true knowledge can replace it. It is typically that during this process, the feeling of empty-handedness (with regard to knowledge) can cause the most discomfort. However, it is important that we endure such discomfort, as truth typically sits just beyond it. We may also reject new ideas due to our fear of change. The unknown can be a difficult endeavor to explore. To some, that which is familiar can seem pretty inviting by comparison. Consequently, they do not typically accept the journey unless there is excessive incentive to do so. In this case, it is important that we do not give into the temptation to accept comfort over truth. If we genuinely want truth in accuracy, it is important that we stay the course. To contrast, if we do not care about truth, it is important that we openly admit this to ourselves and avoid pretending that we do. Mental flexibility takes a level of courage that many have not yet found. This level of function is not typically for those who require emotional security from outward sources. This type of flexibility is only for those who have learned to anchor themselves in a humble and yet self-honoring way, and who are willing to forgo comfort for the sake of the most accurate information. This level of dedication is a key component in the process of discernment, and it is this discernment that will best serve us on our path of awakening. Well, if you have just been "warming up" with your writing, then I am very excited to see where you take DTM. Thank you!